The KL9060 adapter terminal is attached to the end of the Bus Terminal block in the same way as the standard terminal KL9010. The block is terminated with the KL9060 and provides the opportunity to connect one or more power terminals of the KL8001 series. In the KL9060 the K-bus signals are fed into a ribbon cable together with the 24 V DC for the power contacts. Power for the electronics of the KL9060 and also for the internal electronics of the subsequent KL8001 power terminals is provided via the K-bus. The power contacts and the associated connection points are electrically isolated and fed to the output stages of the power terminal. This connection is short-circuit-proof and capable of bearing up to 1 A. Supply voltage feeding from one power module to the next can be achieved without any additional wiring. The KL9060 forms a properly working unit together with at least one KL8001. 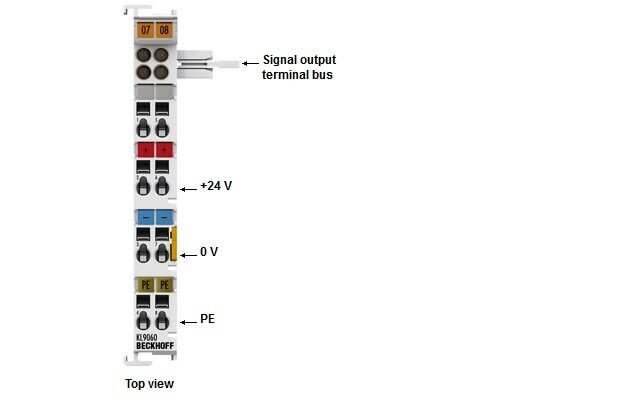 No further parameterising or configuration work on the KL9060 is necessary apart from plugging-in the K-bus extension cable. All diagnostic and commissioning tasks relate directly to the power terminal.